Not only do I love spending time in my own home, decorating it and furnishing it with lovely things, I love being inspired by other people’s homes or by beautiful interior designers, home shops and vintage fairs. 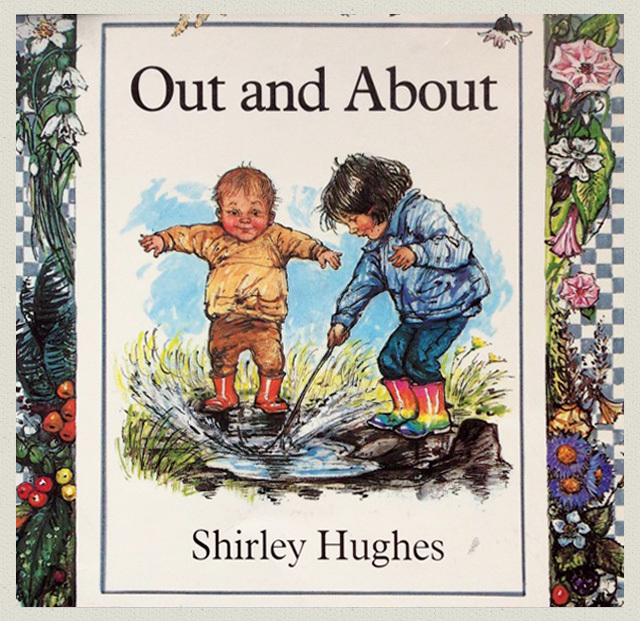 On this page I’ll share some of my recent finds and discoveries from my travels out and about (this is also the name of my absolute favourite children’s poetry book ‘Out and About’ by Shirley Hughes – filled with gorgeous drawings and lovely poems – definitely worth a read!). 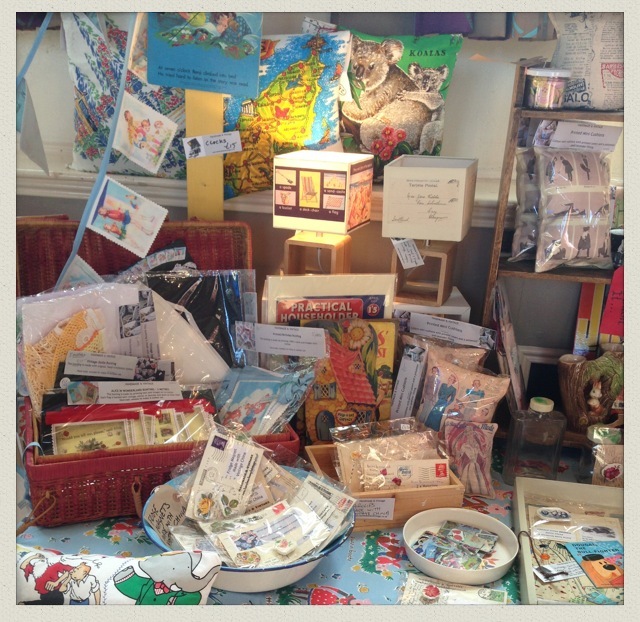 Have a look at my Calendar as well, for different Vintage and Home fairs, bazaars and events. 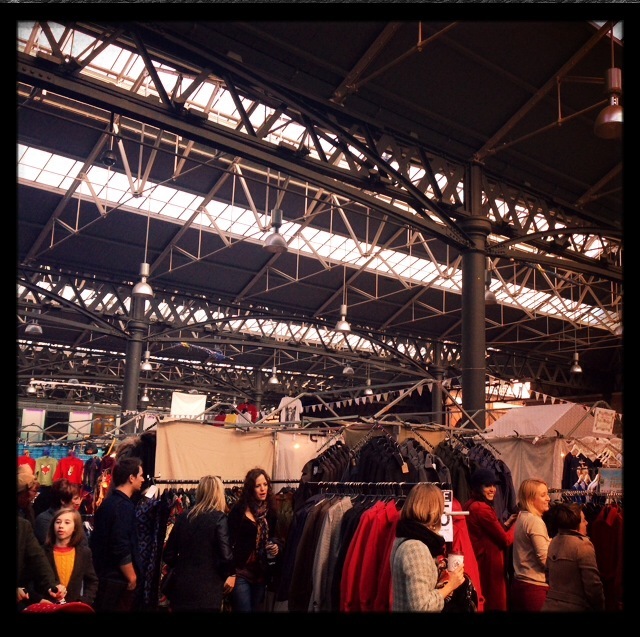 Spitalfields Market in the East End of London is the city’s oldest market. Open every day, it boasts a diverse range of stalls (up to 110 on its busiest days), and features independent retailers showcasing a whole range of quirky items: everything from vintage clothing and accessories, to handmade glassware and jewellery, from custom artwork and unique prints to pre-loved books and vintage magazines. 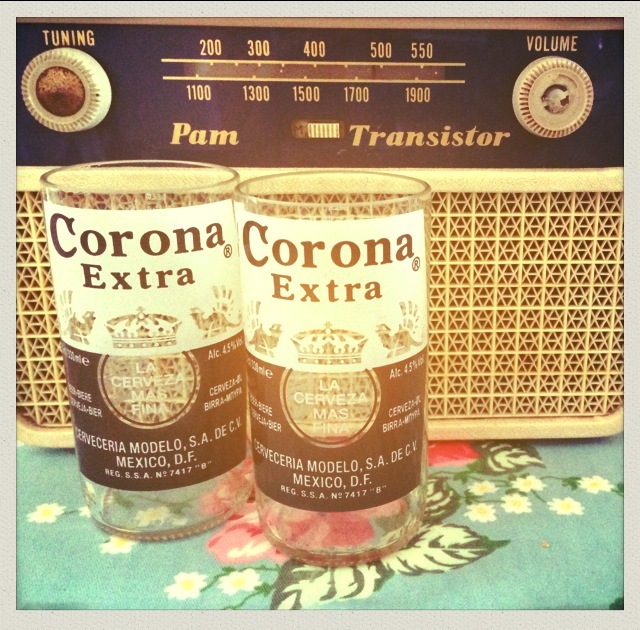 and these quirky glasses, fashioned from old, cut-off beer bottles from another trader. The market is surrounded by independent boutiques selling beautiful and unique homeware items, fashion and jewellery. One such independent retailer is ‘Elemental’, which was established 15 years ago and offers a range of vintage, retro and antique furniture along with reused and upcycled items. The shop has an eclectic and ever-changing collection of seating, lighting, storage solutions and curiosities and it was nominated for the Homes and Antiques Vintage Shop of the Year Award 2013. There are also lots of stalls selling delicious hand-made cakes, breads, jams and salads and plenty of cafes and restaurants around the outskirts of the market, providing the perfect place to refuel after a good day’s vintage rummaging! With Christmas coming up, this is the perfect place to start your search for individual and unusual gifts. 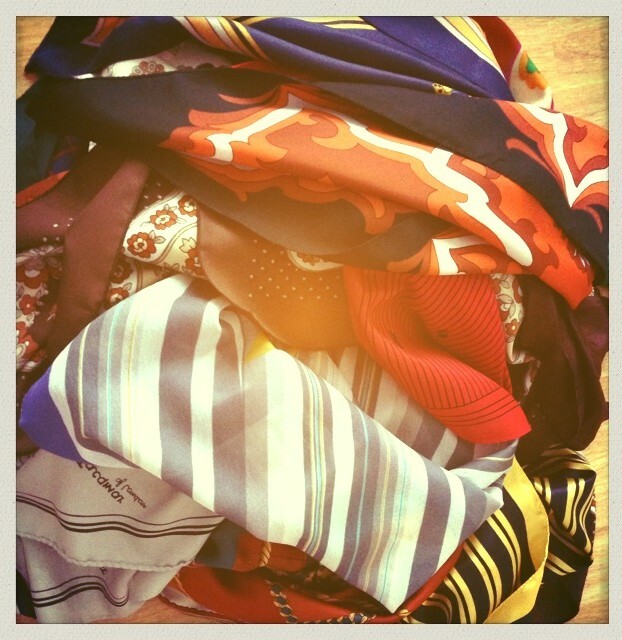 No matter what your tastes, you are sure to find something you like here! 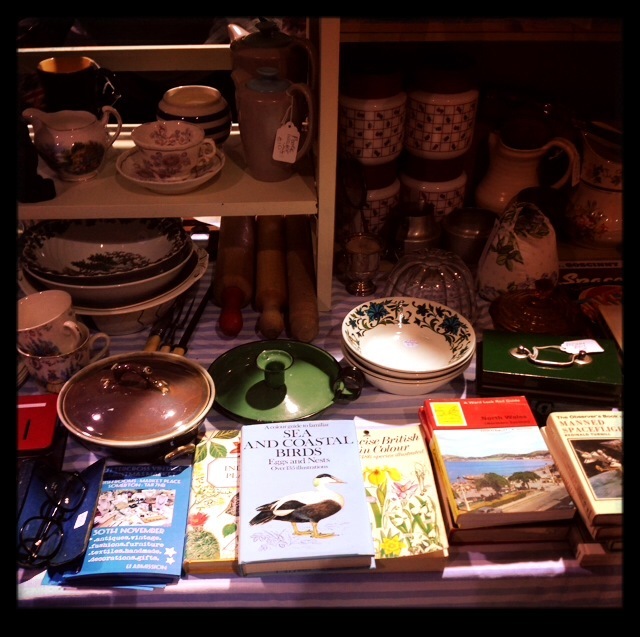 and Homes And Antiques were also there with some lovely vintage things and copies of their books and magazine. 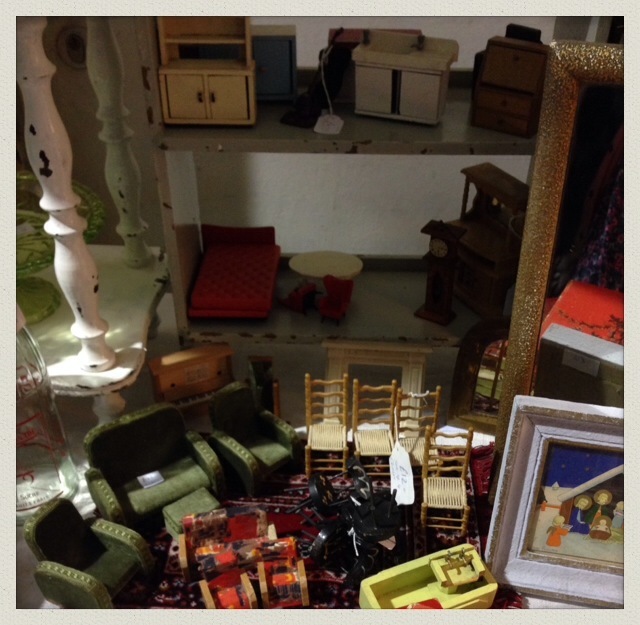 and the really cute dolls’ house furniture, which was so sweet! Pick and Mix Vintage had a beautiful range of vintage glassware, jewellery and books and there were many stalls filled with gorgeous, eclectic items for the home. 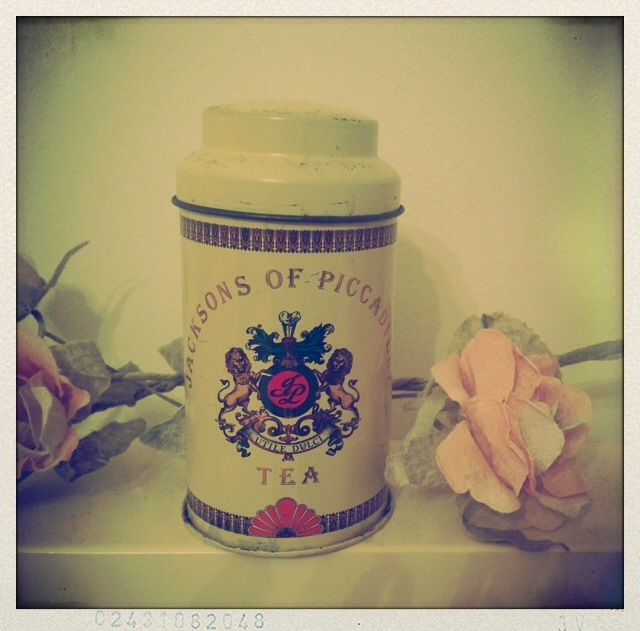 I bought this ornate tea tin from one homeware stall. 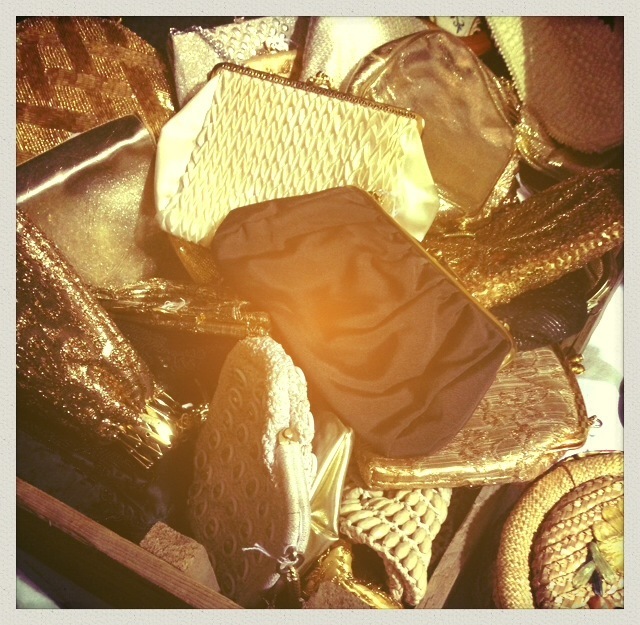 There were also some gorgeous vintage and retro bags on another stall, which I absolutely loved! 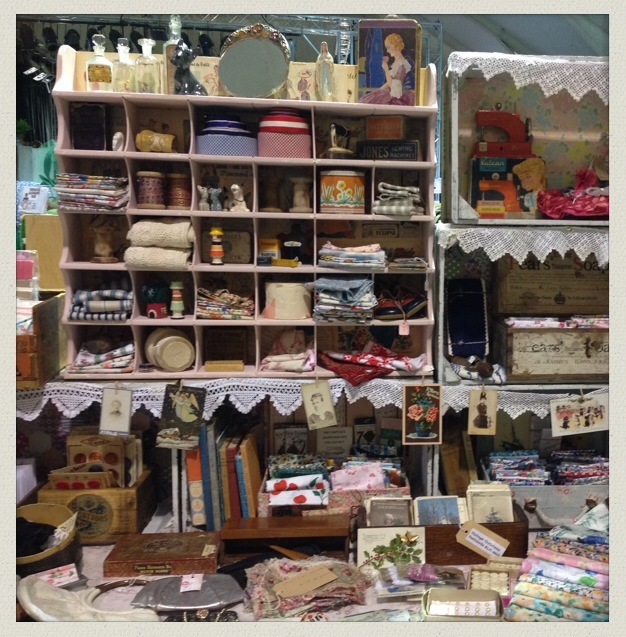 The Shabby Chick stall had a lovely range of vintage fabrics and patchwork hexagons, some of which had already been stitched together, to make patchwork projects really simple. 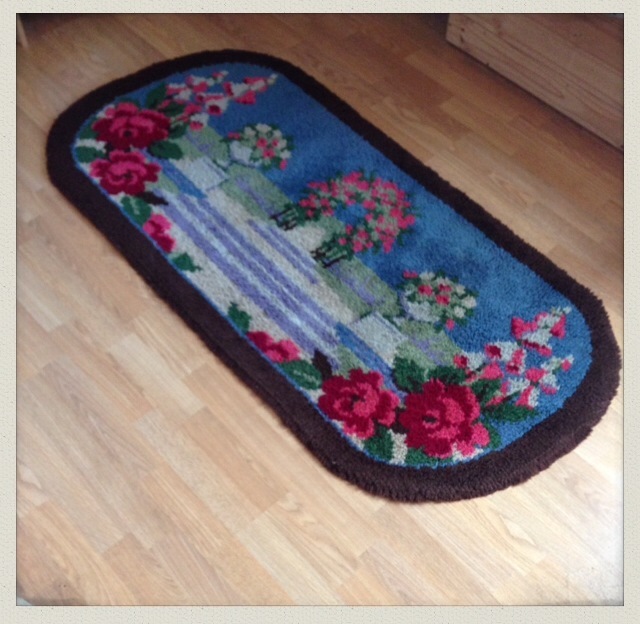 I also bought this beautiful and unique vintage rug from the Shabby Chick stall. All in all, another lovely morning out – I shall look forward to the next one! 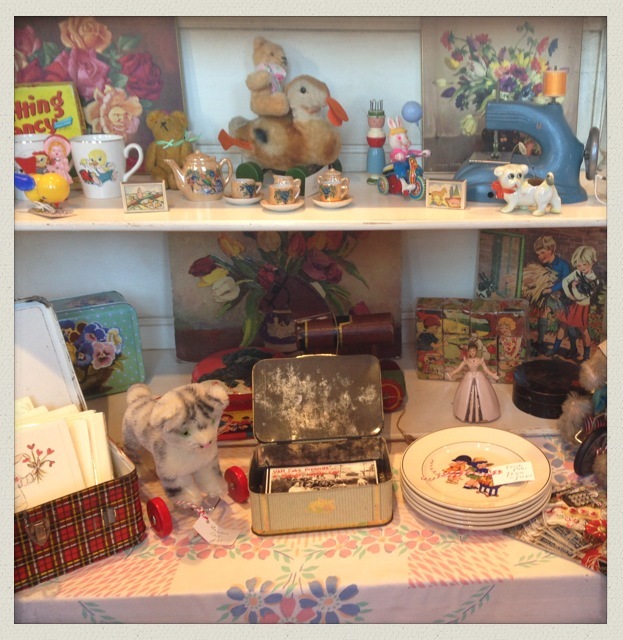 Yesterday, I went to the market town of Devizes in Wiltshire to visit The Vintage Bazaar – a wonderful collection of lovely vintage stalls, with friendly stall-holders and beautiful vintage finds. 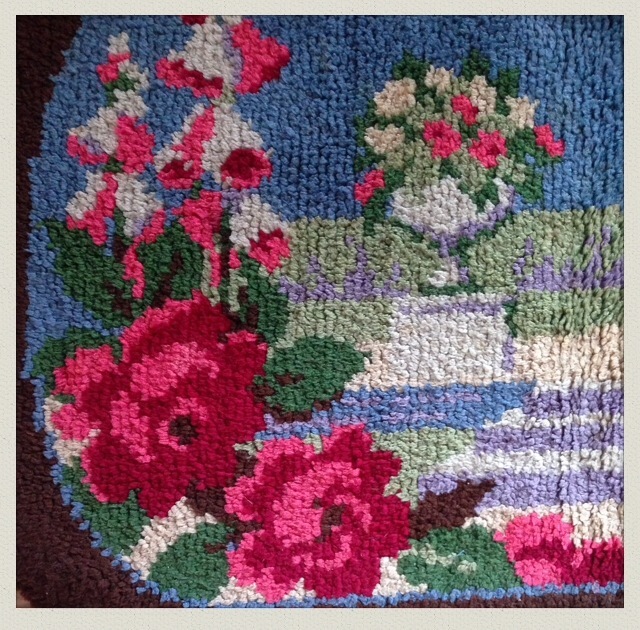 I first discovered The Vintage Bazaar in February and enjoyed it so much I’ve been really looking forward to this one – and I wasn’t disappointed! 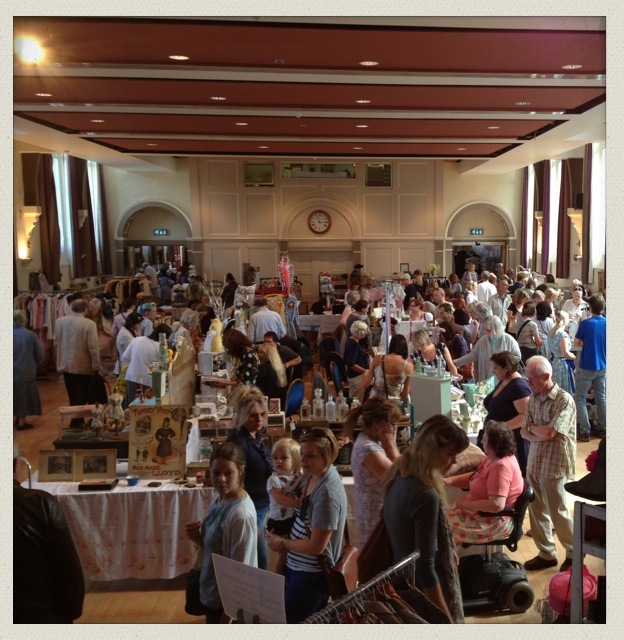 The Ceres room at The Corn Exchange in Devizes was packed with gorgeous stalls, keen vintage-seekers and a busy, bustling atmosphere. Stalls included: Lost & Found Vintage with a stunning range of upcycled painted chairs and bold, stylish cushion covers; Faded Rose Vintage with an elegant selection of “all things French, Faded and Fanciful”; Nostalgia at the Stone House with a charming collection of unique dolls, gifts and accessories, made using vintage fabrics; All Things Vintage And Beautiful, with an inviting stall and a really lovely selection of, in their own words, “An eclectic mix of beautiful vintage things for the home”; Ted And Bunny with beautiful bundles of vintage books, gorgeous tins and sumptuous fabrics, and many more. 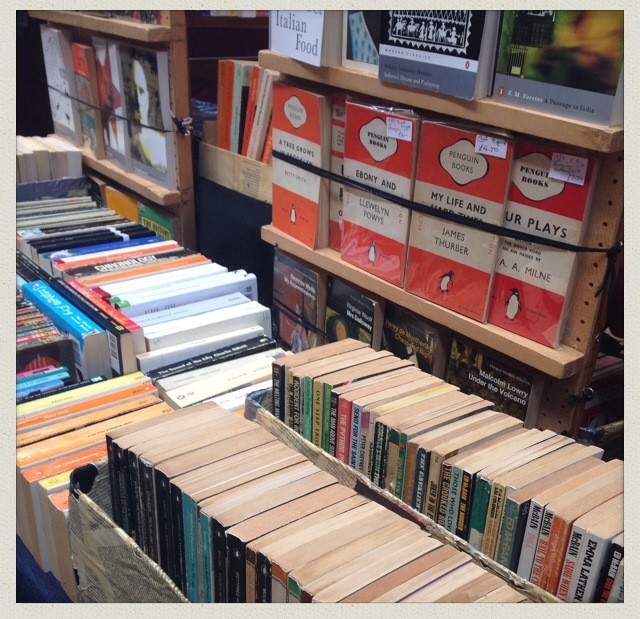 and there were some truly lovely children’s books and toys on the Cowboys & Custard stall. 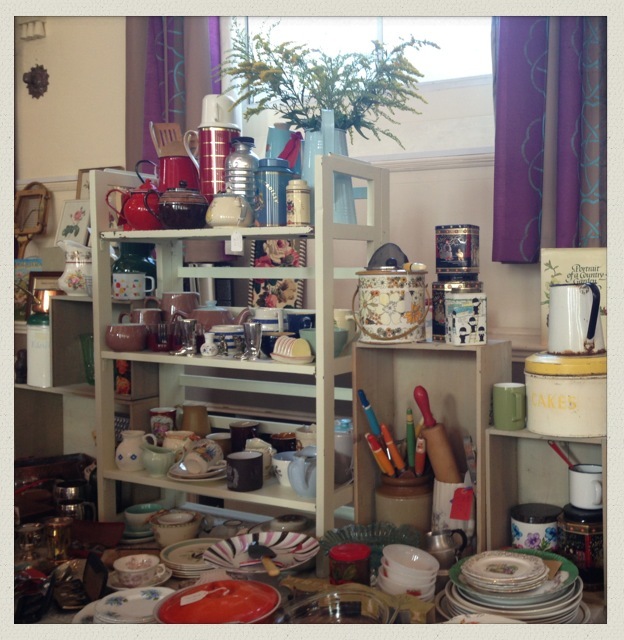 I had a lovely chat with the lady on the Homes And Antiques stall who has done 38 vintage fairs in the last year (!) and I bought a beautiful printed notebook. 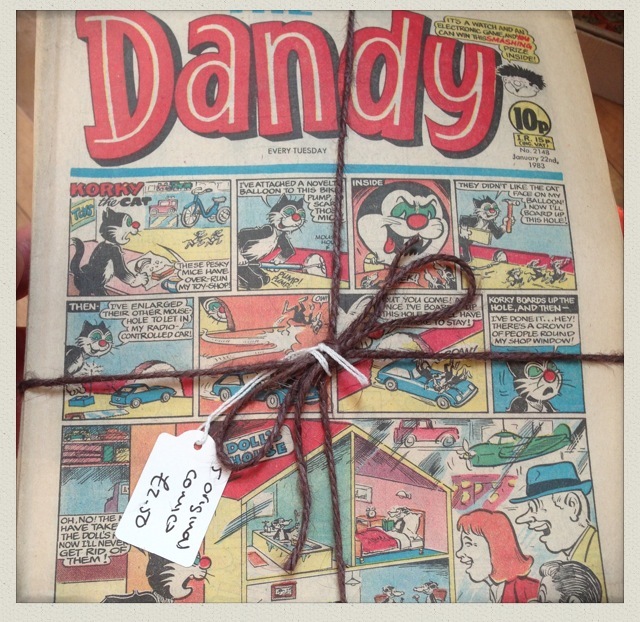 I also bought myself a bundle of ‘Dandy’ magazines for £2.50 from Handmade & Vintage, which had lots of classic children’s prints and some gorgeous Alice in Wonderland bunting. 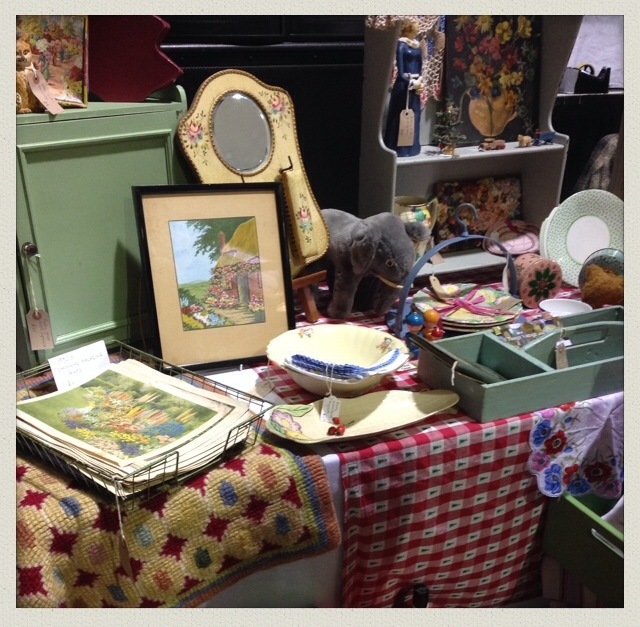 All in all, I had a brilliant morning wandering around the stalls, chatting to different stall holders and being inspired with so many ideas to make my house a home. 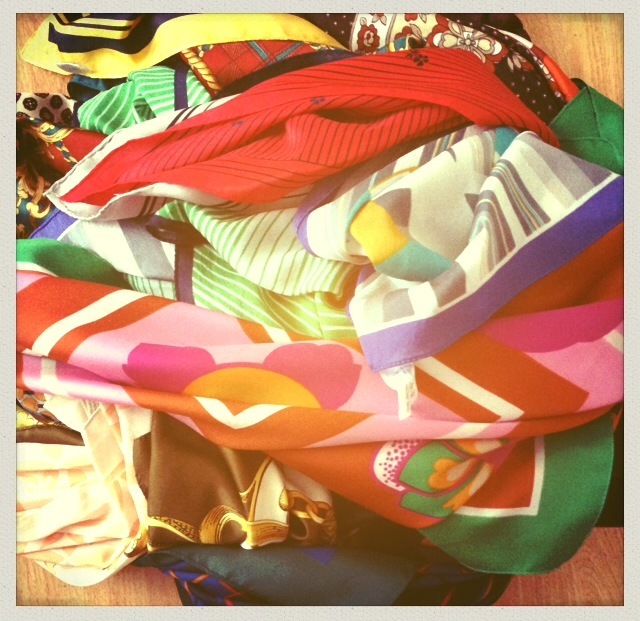 And all that for £1! I can’t wait for the next one!